(Phys.org) —Astronomers have discovered light echoing off material surrounding a recent supernova explosion, SN 2009ig. The dust and gas that are reflecting the light are so close to the eruption center that it is likely related to the progenitor star. This discovery supports the theory that exploding white dwarfs become unstable from matter donated by large, non-degenerate stars. The light echo seen from SN 2009ig is only the sixth discovered from a Type Ia supernova, and it is the most luminous of the echoes. An echo on Earth results when a loud sound is heard directly and again after being reflected by a wall to the listener. Because of the longer path length taken by the redirected sound, it is heard slightly later than the original noise. A light echo works the same way. Direct rays from the flash of a supernova are received at the Earth while some rays are scattered by particles in the host galaxy and redirected to the Earth. As with sound echoes, the time delay and light-echo amplitude depends strongly on the distance between the source and the reflecting surfaces. SN 2009ig was discovered less than a day after it exploded by the Lick Observatory Supernova Search. It was found in the galaxy NGC 1015 at a distance of 127 million light-years in the constellation Cetus, the sea monster. SN 2009ig was the brightest supernova of 2009 and was well studied by amateur and professional astronomers around maximum brightness. Observations with the Large Binocular Telescope and the Kitt Peak 4-meter telescope began in 2010, after SN 2009ig had faded by a factor of 10,000 from its peak brightness. "We planned to study how radioactive elements generated in the explosion decay with time, but we were surprised to see the fading abruptly halt. This was not a supernova we expected to produce a light echo," said Peter Garnavich, professor of physics at the University of Notre Dame, who is the lead investigator of the project. SN 2009ig was classified as a normal Type Ia event. Type Ia supernovae are thought to be thermonuclear detonations of remnant cores of stars known as white dwarfs. This type of supernova was used to discover that the expansion rate of the universe is accelerating, implying that a mysterious dark energy dominates the content of the universe. Yet, the progenitors of Type Ia explosions remain uncertain. "We have used these explosions as precise candles to measure cosmological distances. It would be great to know where they come from," said Garnavich. There are two competing theories on how white dwarf stars become unstable and explode. The single-degenerate scenario has a large star donate mass to the white dwarf until instability is reached. The double-degenerate model proposes that two white dwarfs combine to reach the instability limit. The dusty, messy neighborhood around SN 2009ig supports the single-degenerate scenario. The discovery was announced today at the 222nd meeting of the American Astronomical Society held in Indianapolis, Indiana, with coauthors Peter Garnavich (University of Notre Dame), Peter Milne (University of Arizona), Mark Leising (Clemson University), and Ginger Bryngelson (Francis Marion University). So... the luminosity of a Ia super nova was brighter in the event of material reflecting a light echo? Is that a problem for judging its distance? If it makes up a significant portion of the light that reaches us - yes. If the standard candle is not-so-standard then we need to do a bit of recalibration and the expansion numbers will have to be slightly revised (or at the very least the error bars will get a bit bigger). It's certainly not on an order of magnitude that type Ia stars can be no longer used as reference. But it will make them more of a "standard-plus-minus-epsilon". If this conjecture of two-star systems stands, then I suspect the material drafting onto the main body star is dirty metalized gas which actually is the death knell for the receiving star. Perhaps the creation of this 'garbage can' star was supposed to have been much further out where it would not contaminate the main star but the energy was insufficient to lob it out further? All stars we have ever studied contain a small amount of metals and our own Sun is metal rich. In fact you have it the wrong way round, Pop III stars which would have the lowest metallicity would be much more massive and therefore very short lived due to the lack of metals. If it makes up a significant portion of the light that reaches us - yes. Are you sure? It's not going to change the total luminosity, just spread it out a bit. From a great distance, it all still looks like a single point source anyway. Besides, don't they typically measure the radio frequency intensity to judge the distance? The dust halo would be transparent in radio waves, so this echo wouldn't matter. Also, it should be easy to remove the echo from the image, since there's a time delay. Those waves would be out of phase with the original light. This is how they occlude stars from images when they want to get an image of an exoplanet. Are you sure? It's not going to change the total luminosity, just spread it out a bit. There's two ways the luminosity is affected. Also, it should be easy to remove the echo from the image, since there's a time delay. Since they note that the dust is very close to teh progenitor star (and a supernova isn't an on/off event) it may be too close for the echo to be separated. that doesn't make sense unless the dust is actually producing its own luminosity. The original source radiates roughly the same all the way around, and so does the dust. The total number of photons leaving the star doesn't change, so if you claim that more are reaching us, then more photons must be reaching EVERY possible observation angle. You can't increase the photons leaving in every direction. The only way the dust can make it appear brighter to us is if it makes it appear dimmer in some other direction. Just like the mirror in your car headlamp. that doesn't make sense ... The only way the dust can make it appear brighter to us is if it makes it appear dimmer in some other direction. For objects inside the Milky Way, where you can see both the star and the halo, it is possible to differentiate them. These novea typically aren't where their use as a standard candle is important, since relatively close objects have parallax shift. The distant novea in other galaxies are so far away that the star and its halo appear as one object. The total light from the star can only be dimmed by a halo around it, not brightened. If it is dimmed, that should be detectable in the spectrum, and can be compensated for accordingly. The light echo shouldn't affect our distance estimates to other galaxies. For objects inside the Milky Way, where you can see both the star and the halo, it is possible to differentiate them. Yes. But we're talking about a very fresh supernova here (where the blown-off material hasn't had a lot of time to move), so the echo is very close to the signal from the supernova event, and hence should overlap significantly. The light echo shouldn't affect our distance estimates to other galaxies. Probably not significantly. But I do think we will have to add some (minor) compensating term which will have to be recmoputed for each supernoval separately. The 'standard candle' argument works for the mechanism of the star itself. But since the light that reaches us seems also dependent on the immediate environment of the star (dust/no dust) we'll have to take the 'standard' part with a grain of salt. Possibly there is a even systemic bias as older/further away supernovae should be in more dusty environments than closer ones. 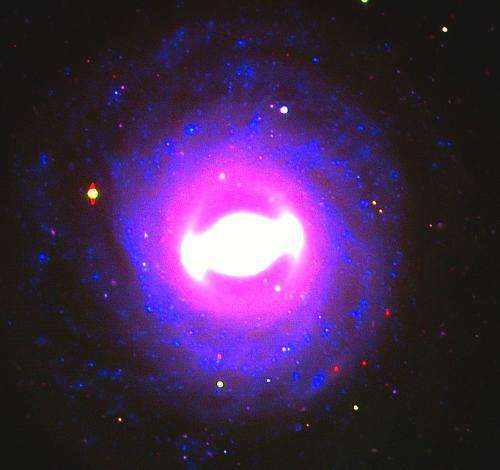 The Invisible-Visible matrix mode will be self-evident through Nature.SN2009ig in galaxy NGC 1015 at 127 million light-years in the constellation Cetus must be searched for links to Heart of the Universe-around 10^5 LY and in-turn to Earth region around 100 AU. The real interaction of echo-light in dimensions with spread functional index help Science to avance in the right spirit. Dark-mode concepts are obviously at the wrong end.